Iranian state TV has aired footage of a woman, claiming to be the one sentenced to death by stoning, saying she has not been lashed or tortured. A blurry image showed a woman in a chador purporting to be Sakineh Mohammadi Ashtiani, who was convicted of adultery in 2006. The woman says that the reports of her being recently punished for a newspaper photograph were "false and rumours". Ms Ashtiani's case has sparked outcry in several countries. 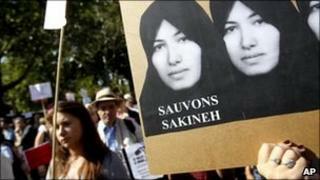 Officials suspended her stoning sentence in July, but there are fears she will now be hanged. Ms Ashtiani allegedly received 99 lashes for indecency after the Times newspaper in the UK published a photo of a woman not wearing a veil, who they believed was Ms Ashtiani. The Times has since apologised for the mistake. In the broadcast on Wednesday, the woman identified as Ms Ashtiani says she has "not been tortured, at all". "All these words are my own words. Nobody has forced me to appear before camera and whatever I say is my own words," she says in the Azeri language, with Farsi subtitles. The video is the second broadcast by authorities relating to the Ashtiani case. In the first, aired on 12 August, Ms Ashtiani confesses to involvement in the murder of her husband. Her lawyer said at the time that the interview came after two days of torture. In the week prior to the confession, Ms Ashtiani told the Guardian newspaper, through an intermediary, that Iranian officials were trying to "distract attention and confuse the media so that they can kill me in secret". She also said she had been previously acquitted of the murder charge. In the latest footage, the woman also says that she conspired to kill her husband. She was originally convicted in May 2006, when a criminal court in East Azerbaijan province found her guilty of having had an "illicit relationship" with two men following the death of her husband. She was given 99 lashes. But that September, during the trial of a man accused of murdering her husband, another court reopened an adultery case based on events that allegedly took place before her husband died. Despite retracting a confession she said she had been forced to make under duress, Ms Ashtiani was convicted of "adultery while being married" and sentenced to death by stoning.